In the fall of 2011 we installed an 8″ insertion valve in Taunton, MA for Albanese D & S. The process is fairly straightforward. It is outlined and depicted in the photos. Valve outer body is mounted and air tested on a clean piece of pipe. Temporary horizontal knife gate is bolted on top of valve body. Top tap is made through valve body, cutter is retracted, and temporary knife gate is closed. Tapping machine is removed, cutter removed and valve body is mounted on insertion tool and put into tapping machine. Entire unit is mounted onto temporary knife gate valve and bolted down. Knife gate is opened after housing above valve is equalized with water pressure to minimize the surge of air up into the housing. This is especially important on high pressure applications. Valve disc is inserted into valve body by using air pressure and set pins are screwed into the O-ring on top of valve body. 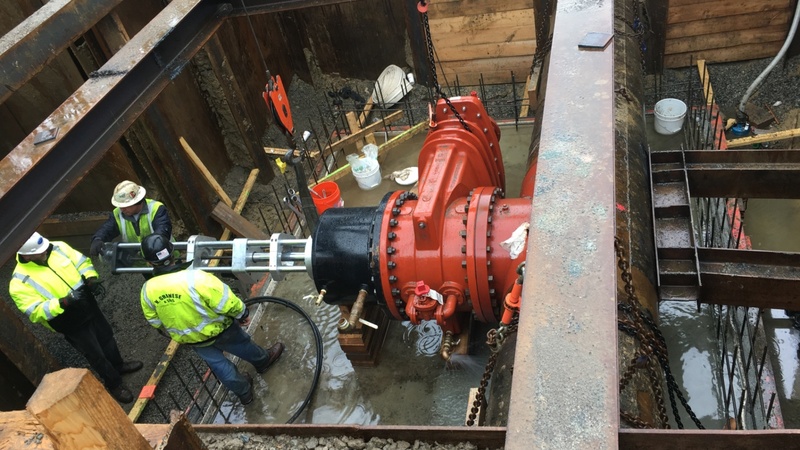 All equipment is removed from the pipe, and top flange and operating nut are installed. This process takes approximately 1.5 hours for a valve up to 8″ in size and 2 hours for a valve up to 12″ in size. The disc is inserted so the valve is in the open position. There is no interruption of flow.These valves can be used on any pipe material and are available up to 16″ in size.